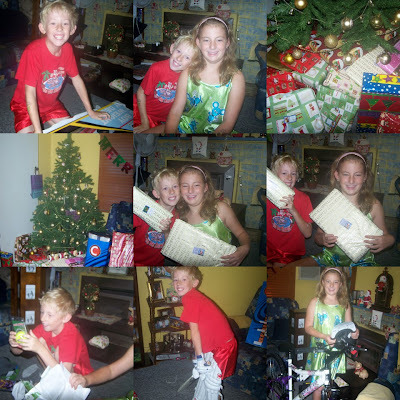 I hope everyone had a Christmas as special as mine! I had a fun filled & special time shared with my beautiful family, with lots of presents & food! I got a little spoilt this year! My D.D reduced me to tears on Christmas morning when he presented me with one of my pressies. He had gone to the jewellers & picked me out a set of gold ear- rings with diamond chips in them. They are just beautiful! so much so that I am too scared to wear them...lol..I got a lovely bottle of perfume, some make up & a photo CD stand from Santa as well! So now the silly season has almost finished & the visitors have all gone home I feel the NEED to scrap!!!!! !SO last night I created a page. My D.H dresses up as Santa almost every year & this year Maddy gave him a big smooch while he was dressed up. 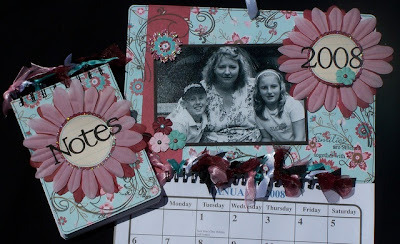 And just prior to Christmas I made another Calendar & note book for my Darling Daddy & Aunty Pat. It turned out so yummy that I am going to make another one the same for myself. I wish anyone that visits here a joyful time for the rest of 2007 & a Happy New Year for 2008! I have had some creative FUN today! 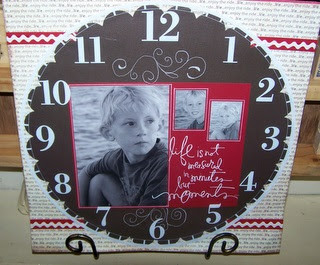 I seem to be running out of time.....ohhh....but I managed to finally get the teachers presents made today. Both my kiddies have lovely lady teachers. Both are young & trendy! 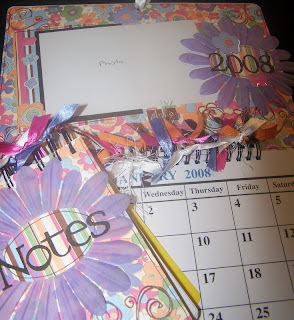 So I made them both calendars & note books to match. 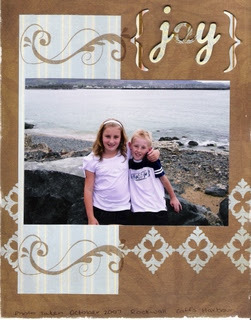 I hope they like them as I sure did have fun creating them! 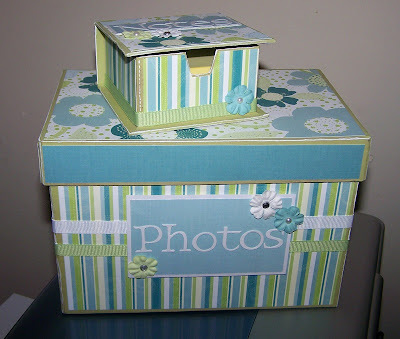 These are really economical to make. I sure hope the teachers like them! 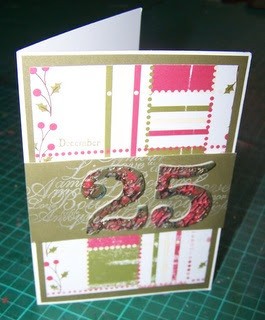 On other news I received some lovely cards this week from dear friends, The first is from Kristy , my local friend. What a lovely card Kristy! the next is from Tracy. Who I had the pleasure of meeting a couple of times over the last few months. 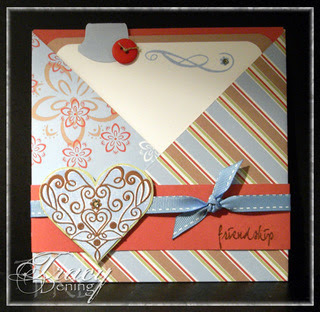 Tracy is a very talented cardmaker & this lovely card came in the post for me this week. 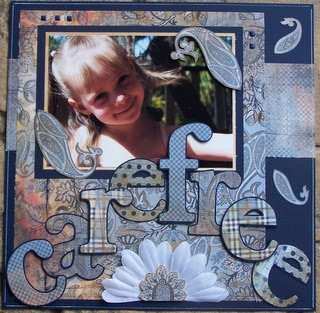 This is one of the yummy new K & Co papers that I used to create this page (it's of me as a little girl). I haven't had a huge amount of time over the weekend to do a lot with it. 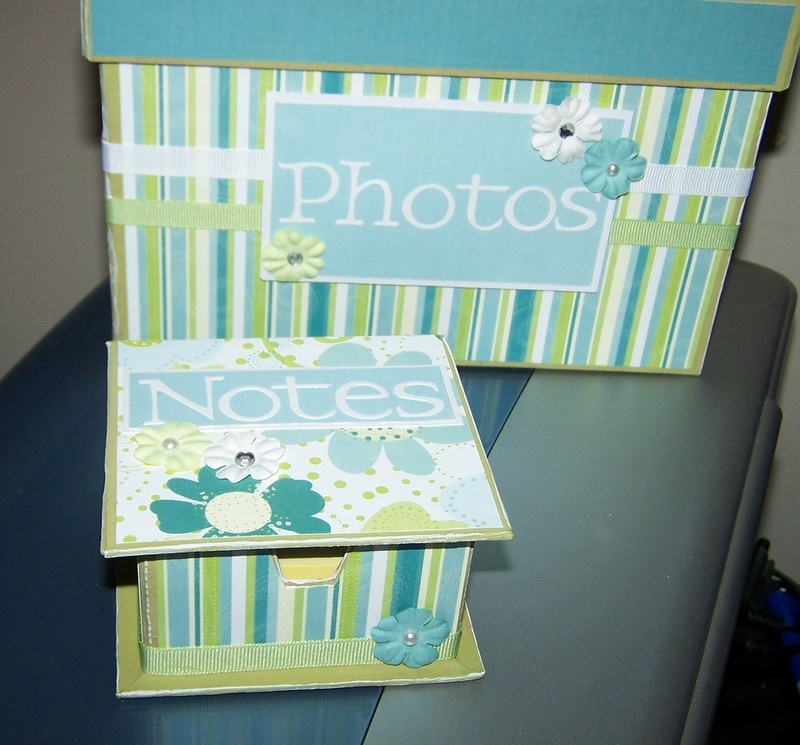 But I did create a 6x6 mini book. well done if you are still reading! it sure is a long post for me! 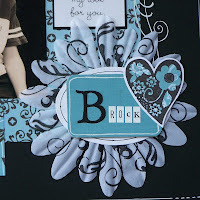 I made these simple cards for our cardmaking day last week BUT I thought that I would share them with YOU!!!! Just want to share with the world my proud Mummy moment today! 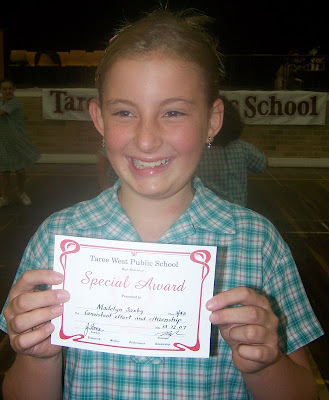 My D.D received a Special AWARD today at the schools presentation day. it was for consistent effort & citizenship! Mummy & Daddy were very proud to say the least! IN THE SPIRIT OF THINGS! 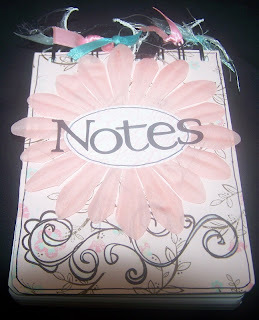 I picked myself up these gorgeous NEW Love Elsie, Noel p.p's, last week at SCRAPSIDAISY & was just busting to use them. 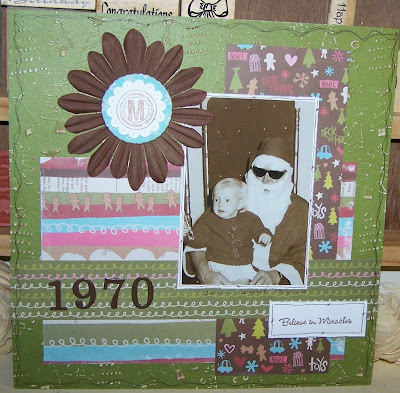 I used a photo of myself on Santa's knee from way, way back in 1970! BOY has Santa changed since then!!!!!!!!..........LOL. The papers were(as usual) really easy to put together! SORRY about the poor quality of photo! I will fix it soon! IRL the colours are much brighter! Thanks heaps for dropping by & be sure to check back soon as I will be adding a little RAK! It seems to be what we have been all looking for. It sounds like heaps of fun! 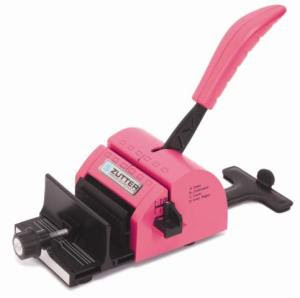 It is called the Sisterhood of travelling stampers & I am in group 4. Just click on the link if you are interested in joining. It should be fun! All you have to do is put the sisterhood list in your sidebar & visit your sisters (around once a week) & leave a comment to encourage this addictive craft that we are so, so addicted to. It will be open until it gets to 30 (I think) So I will post it in my side bar as new people join. My besty Buddy KRISTY is in the same group too.....WOOHOOO!!!!!!!! I promised on Saturday night to share what I was about to create. WELL....that didn't get finished until today! So here I am sharing...right NOW!! I was really excited last week at work when we got in some paper-mache CD boxes & post it note holders. 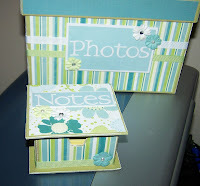 They are really plain BUT can be transformed really easily into something lovely for your scrap desk. The CD box is perfect to store (we are always in search of photo storage) all of your enlargements in. 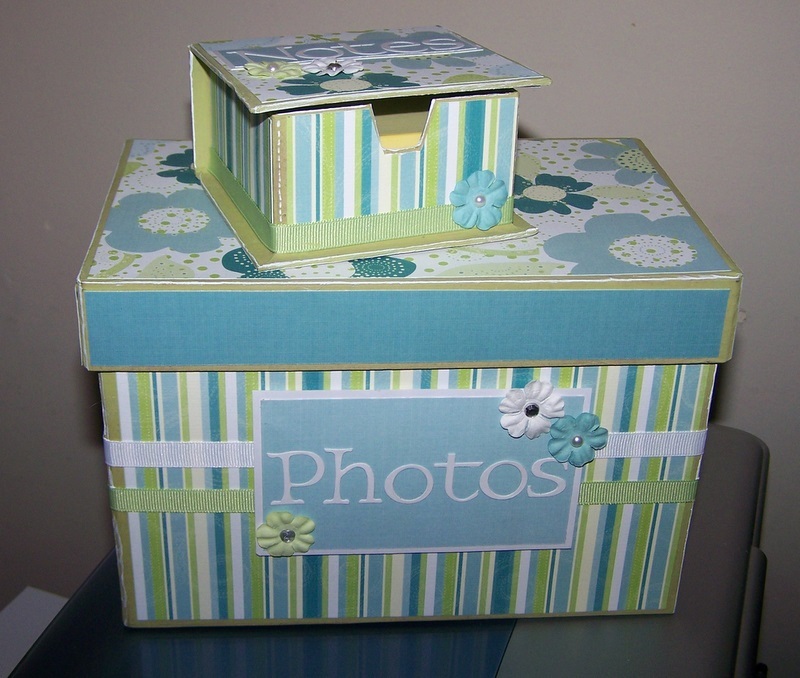 I have used mine for my 6x8 & 5x7 enlargements. 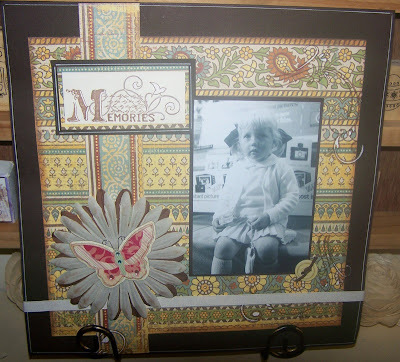 I used the new release Chatterbox Pattern papers. I think these both turned out rather elegant! 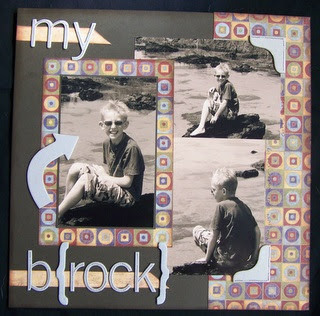 Then I just had to attack some of the other Chatterbox patterned papers So today I found a photo that I had taken of Brock (from our earlier holiday) & created this page. 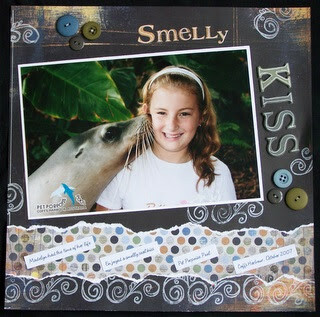 I was TRULY inspired with all the blossoms & rub-ons that KRISTY has been using on her burst of pages of late. So here is what I created today. With the silly Season fast approaching I don't think that I will have as much time to create . BUT I do promise that whatever I create I will share for anyone that wants to look. Long time between posts I know! I am a bit of a slack blogger...yeh yeh! We had my D.H's work Christmas party today & had a wow of a time. 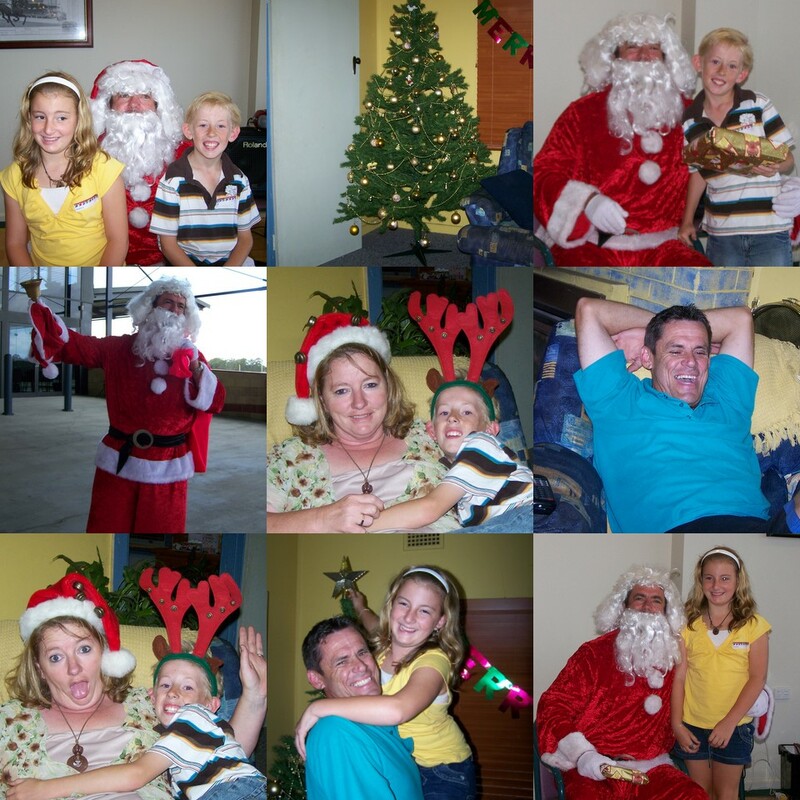 BUT the most exciting part of the day was the TRADITION of putting up the tree & decorating the loungeroom!! Have I told you how much I love Christmas! I am planning to get really creative right now. So if I do finish something tonight I will do another post later. 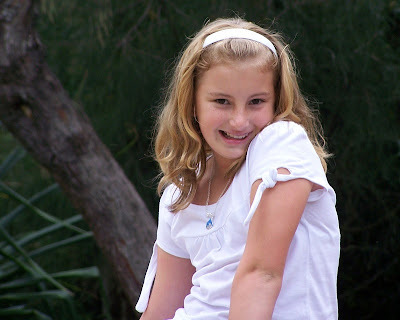 Just wanted to share with you all that my gorgeous GIRL turned 10 today! For those of you that know me, you know how much my children mean to me. So today is a special milestone. 10 is a double digit! 10 is starting to show signs of growing up! The family are all coming to visit this afternoon & she is bringing her bestest friend home from school with her, for nibbles & tea (Pizza of her choice) so I had better get myself organised for the event. There have been more pressies then anyone would need (BUT hey she's special & deserves them!) & I am sure there will be even more this afternoon! A beautiful Sun Shiny Day! 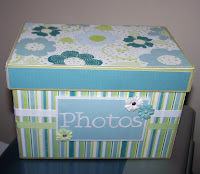 I have had a super busy week But I have just found 5 minutes to share a quick post. 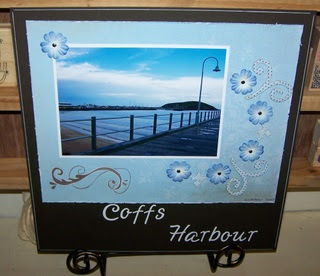 I have had heaps of fun & created a few things! 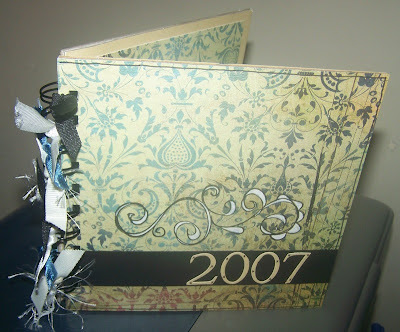 & next I created this calendar for 2008, notepad & pen bucket. 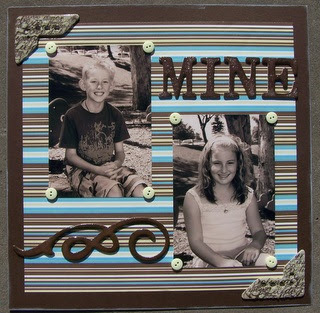 We had a class for this one at SCRAPSIDAISY on Friday & what a great morning we had! 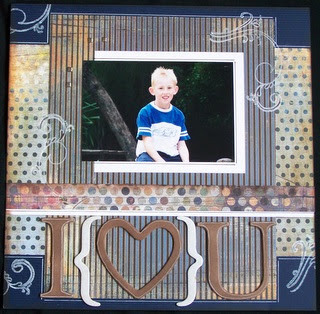 I still have a couple of kits left so if you are interested in creating this stationaary set (give the shop a call on 65535307). 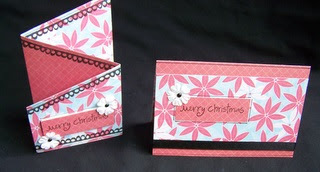 I used the lovely new Cosmo Cricket Hey Sugar p.p's with lots of doodling & stamping on these! 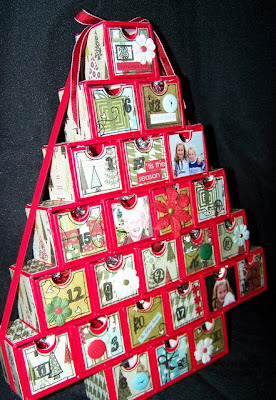 I was inspired by the ever so talented Jen Hall to create one of these Advent calenders. I picked this one up at Target the other day & have been just itching to attack it. 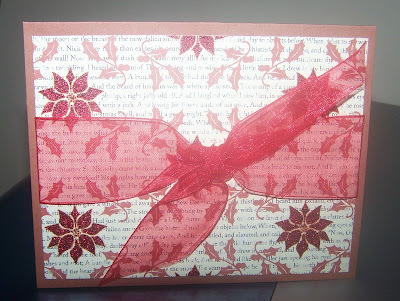 I used the ever so YUMMY Figgy Pudding, Basic Grey patterned papers, Autumn Leaves messy date stamps as well as the stunning Lizzie Anne (L'amour) cling stamps. I know that my kidlets will be busting with excitement & impatiently waiting fot the 1st of December so that they can attack this every day! I have had a wonderful week! 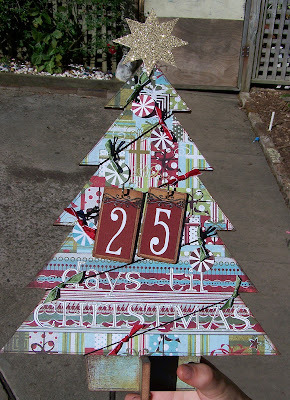 The Christmas Countdown Calendar was a huge success. The Lovely ladies that came to the class were amazing & it was such a fun filled class. So I will show you the whole calendar now. 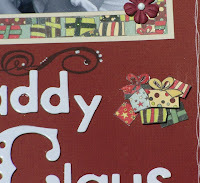 And the last project that I will share tonight is another one with Figgy pudding. It is a wall hanging that will be a class at SCRAPSIDAISY next week. So if you are free give the shop a call on 65535307 to check out the times. As much as we don't like to admit it Christmas is fast approaching! 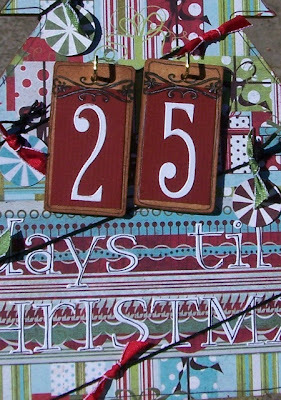 So on the weekend I created this lovely countdown calendar. 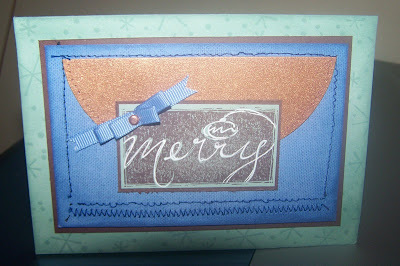 I used the BEAUTIFUL new Figgy Pudding (Basic Grey) patterned papers. 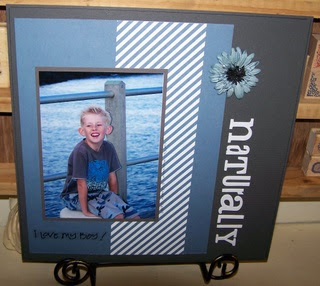 I will be teaching the class on Wednesday at SCRAPSIDAISY!!!! It will be $25 for the class which covers the tuition & the kit. The only suppies you need to bring are basics like adhesives, inks & pens. If you would like to attend please call the shop on 65535307 as numbers are limited. There has been an overwhelming response to this class & it is filling very fast! There are only a couple of places left so if you are interested phone quickly or you may miss out! 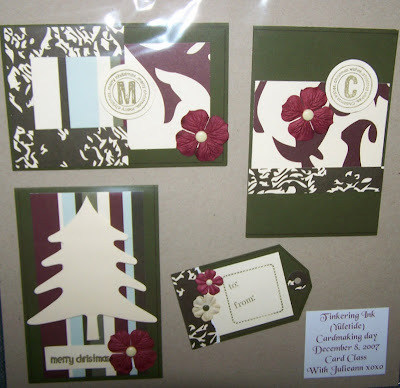 This is the gorgeous pre packaged Figgy Pudding Christmas card pack! I am in love! 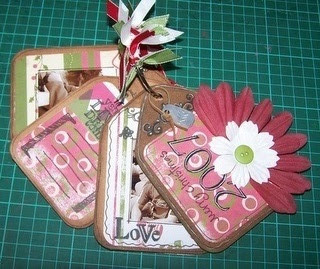 You can pick up your own kit from Scrapsidaisy & create these gorgeous cards to share with your loved ones this Christmas . There are 8 cards in total in the kit & it is such good value for money. A few cards to share. I created a few simple cards to showcase some patterned papers. Some Inspiration came my way! 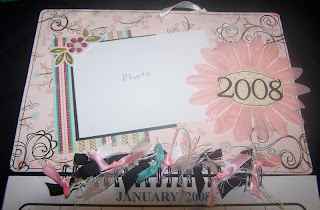 After the amazing day that we had at Scrapsidaisy on Saturday I came home all inspired to scrap some pages myself. 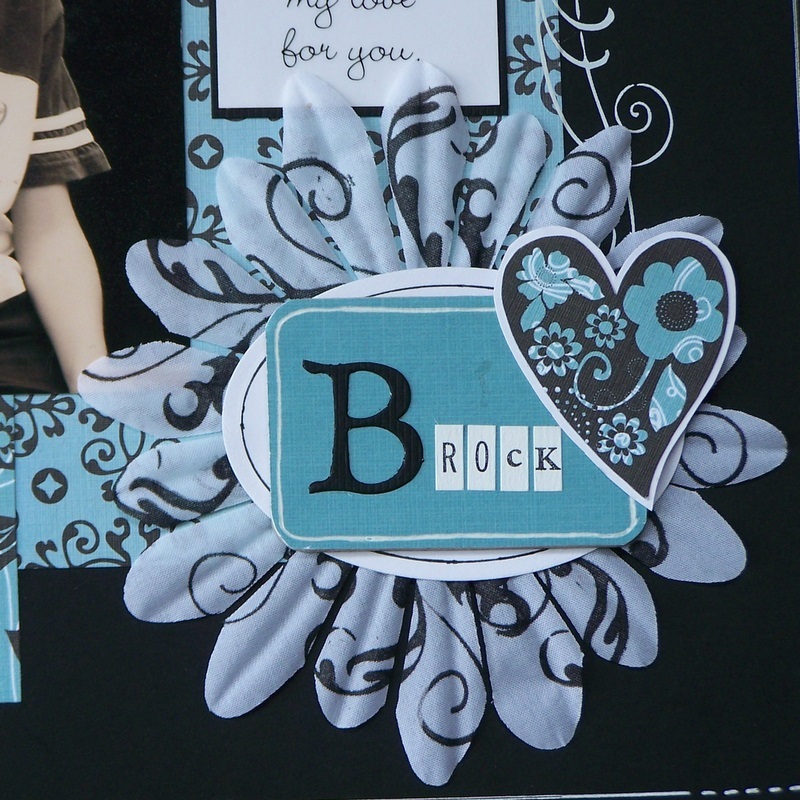 So I spent the other part of the weekend creating with the new Basic Grey Patterned Papers. While I was on a roll I pulled out some of my Paper Loft p.p's as well & created this one. This last page is one that I want to share. I DID NOT create this one! It was created by the ever so talented Michelle G. (A local scrapper & photo of her D.D.) whilst she was instore the other day. I was so inspired by this that I had to do some for myself! & this is where my inspiration came from. 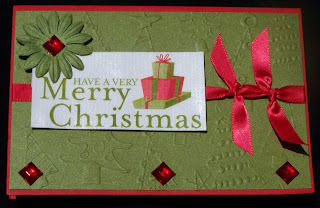 I have some other cards & thing to share but I will post them later in the week. 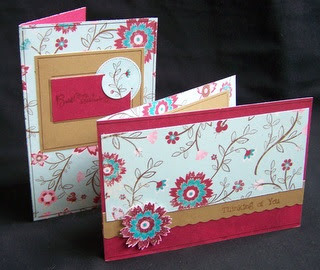 Today at Scrapsidaisy we held another Cardmaking crop. It was another action packed day & I am sure fun was had by all! 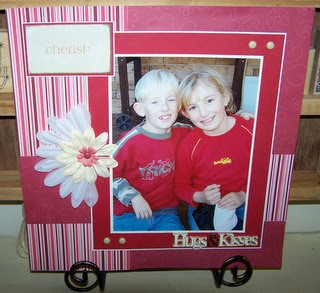 I will share with you a few of the classes that I taught. It was an honour to have you as a guest Tracy! 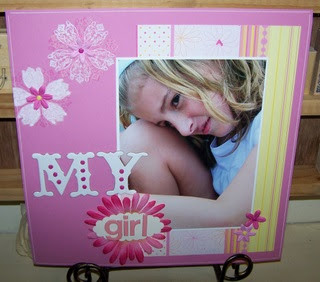 this (above) is the beautiful card that the girls created with Tracy! 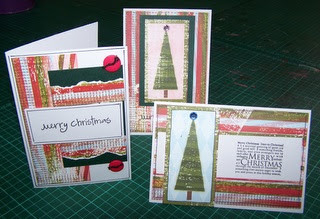 After lunch and as a wind down for the afternoon we had another class that was to create these lovely, simple Christmas cards. 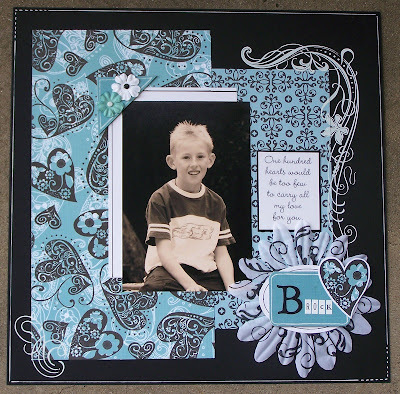 I made a page last week to show that you can use the embossing technique (As on the 25 card) on a scrapbook pages. Here is the page that I made. I had a friend take some photo's for me today so as soon as I receive them I will post them as well.I hope you are all having a safe weekend! When I was having a clean up in my scraproom last week I fould a few pages that had never been finished. So today I was all inspired to finish them off. 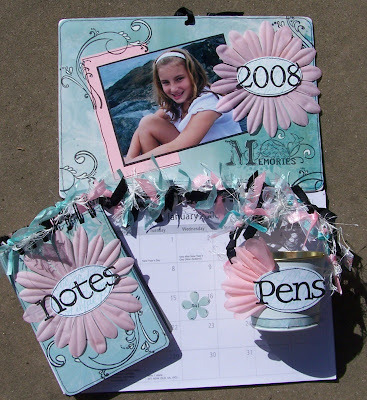 I can not believe the colour combination in the red, pink, white & cream one but I do remember that it was a We.R patterned paper that I loved. and the second one (although not quite as old & sorry Kristy LOL) was another unfinished one, with a Heidi swapp clock overlay! And while I am here THANK YOU to all the lovelies that have emailed me & left comments for my Dear old Daddy. He is doing fine. He will be in hospital for two weeks but is improving everyday, so THANX again! Just a few pages from the weekend. Its funny though! They must be a reflection of my MOOD! I have been feeling a little blue & guess what my pages are???? ?you guessed it BLUE!!! My Dear Old Daddy had a pretty serious fall on Friday and it has been a really worrying time. He will be O.K - I know that NOW- BUT .....at the time of my creations, I was more than a little worried & I truly believe that my pages reflect that. On a brighter note. Last night when I looked back on Friday nights creations & realised the BLUE feeling flowed through I challenged myself to create a brighter page. 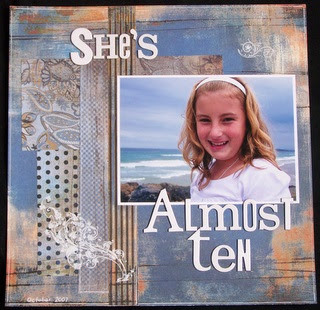 I used a fave photo of my D.D & some old P.P's out of my stash BUT I used my beautiful NEW "My Favourite Things" stamps that I picked up yesterday from SCRAPSIDAISY!